floatingsheep: A Gravity Sink in Wyoming? A Cartogram of Google Placemarks in the U.S.
A Gravity Sink in Wyoming? A Cartogram of Google Placemarks in the U.S.
One of the visualization techniques that we're beginning to work with are cartograms (thanks to Monica) which distort the size of an area based on some characteristic. We decided to do this with the number of Google Maps placemarks in the image below (we strongly recommend clicking on it to get the bigger version). 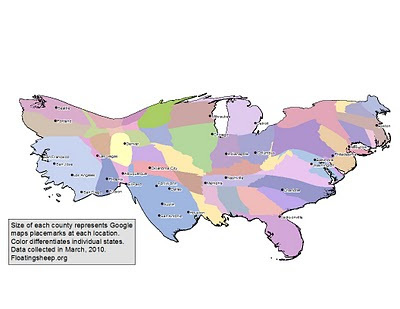 This cartogram helps to visualize the density of the geoweb within the U.S. although other measures such as Wikipedia entries produce fairly different images. Not all geoweb data is created equal. This cartogram was created using the total number of placemarks at the county level so the distortion is at that scale rather than the scale of the state. This is very clear for the area of Illinois around Chicago which bulges out relative to the rest of the state. The west coastal region is another good example as is the area around Boston. At the other end of the spectrum is the contraction in the upper mountain west and great plains. Although we recognize the power of labels and are loath to characterize regions solely based on our maps, there really seems to be a bit of informational gravity sink (aka black hole) in the center of Wyoming. Perhaps it would be best for those in the region to strap down their iPhones lest they be drawn into it.